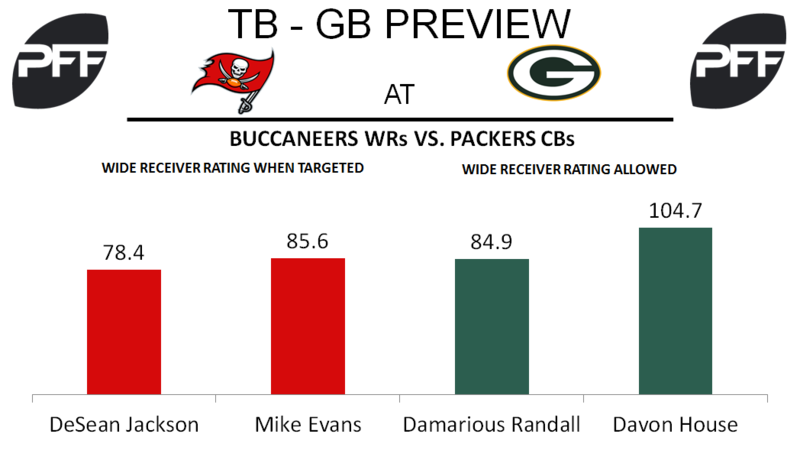 WR Mike Evans vs. CB Damarious Randall – Buccaneers wide receiver Mike Evans enters Week 13 on a four-game touchdown drought, but has one of the best matchups according to PFF’s wide receiver-cornerback matchup chart. Despite the touchdown drought, Evans still leads the team in yards per route run with an average of 1.78 yards. 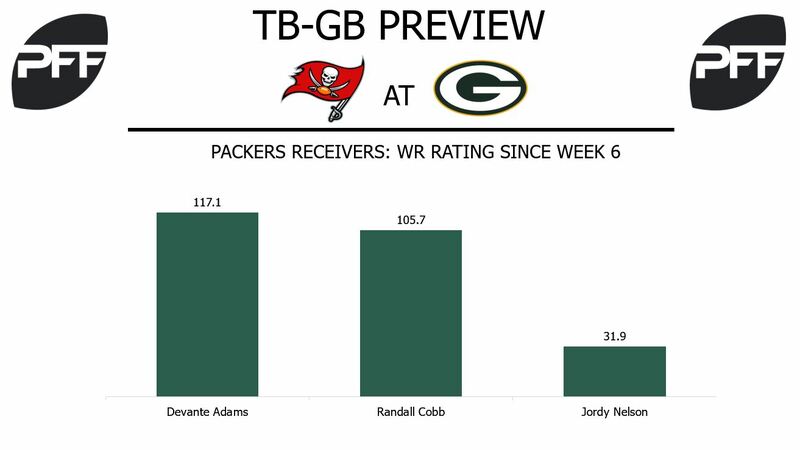 Packers’ cornerback Damarious Randall moves into the slot in nickel packages, but will be lined up against Evans in different base defense package situations. Randall has held his own at times this season and currently ranks 71st out of 119 qualified cornerbacks in yards allowed per coverage snap with an average of 1.23 yards allowed. WR DeSean Jackson vs. CB Davon House – Buccaneers’ wide receiver DeSean Jackson is coming off a Week 12 game where he caught eight passes which was Jackson’s single-game high for the 2017 season. Jackson also has a great matchup according to PFF’s wide receiver-cornerback matchup chart and he comes into this week’s game with an overall grade of 83.6, which ranks tenth among 116 qualified wide receivers. The Packers will deploy cornerback Davon House to try to slow Jackson down. House has been a player for opposing offenses to target, as he ranks 88th out of 119 qualified cornerbacks in wide receiver rating allowed with a rating of 104.7 when targeted. T Caleb Benenoch vs. Edge Nick Perry – One way the Packers can help neutralize the Buccaneers’ matchup advantages on the outside is by providing a strong pass-rush. Edge defender Nick Perry has the highest pass-rush productivity rating among Packers’ edge defenders with a rating of 8.8. While Perry only rushes against opposing right tackles on 21.3 percent of his pass-rush snaps, Buccaneers tackle Caleb Benenoch could be a player that the Packers will look to exploit. Benenoch is stepping in for injured right tackle Demar Dotson, who landed on the injured reserve after sustaining a knee injury last week. On limited snaps, Benenoch has earned a pass-blocking efficiency rating of 82.7, which is a steep drop off from Dotson’s 97.6 rating. WR Davante Adams vs. CB Ryan Smith – Adams approaches Week 13 ranked 10th among receivers with a wide receiver rating of 120.7. He’s been the Packers’ top deep threat, catching seven passes for 250 yards and two scores on throws targeted 20-plus yards downfield. He’s scored five touchdowns and has a wide receiver rating of 137.9 on go routes. Smith ranks 101st among cornerbacks with a coverage grade of 43.7. He’s allowed 1.94 receiving yards per coverage snap, which is the third-highest rate among cornerbacks. Quarterbacks targeting a player in his coverage have averaged a passer rating of 135.1. G Jahri Evans vs. DI Gerald McCoy – Evans enters Sunday with an overall grade of 75.0. He ranks 12th among offensive guards with a pass-blocking efficiency of 97.4. While he possesses a pass-blocking grade of 80.3, his run-blocking mark of 60.9 ranks 35th. McCoy’s overall grade of 90.9 is the third-highest mark for an interior defensive lineman. He’s forced 37 total pressures and has a pass-rushing productivity of 8.1. RB Jamaal Williams vs. LB Lavonte David – Williams is 41st among running backs with an elusive rating of 31. He’s averaging 2.14 yards after contact and he hasn’t rushed for 15 yards or more on a run this season. While he’s struggled running the ball, he’s been efficient in the passing game. Over the past two weeks, he’s averaged 2.1 receiving yards per route run, which is tied for the third-highest rate at his position during that span. David’s run-defense grade of 92.7 and run-stop percentage of 11.1 both rank second among linebackers. He’s also been stout against the pass, earning an 89.4 coverage grade.